There are a number of vendors in the western world that offer Taiwanese Oolongs. Prices vary dramatically vendor to vendor and tea to tea (cheap, expensive) and there are even Taiwanese tea forgeries (i.e. grown in China/Thailand, harvested in a Taiwanese style and marketed as Formosa/Gaoshan Oolong). Navigating the online vendor landscape can be a difficult and often costly endeavor. This section will simply try to help you get what you pay! This article was originally intended to be part of the Taiwanese Oolong Compendium but it quickly became obvious it should be its own separate article. For those interested in a more data-driven approach to the price and finding the best deal for Taiwanese Gaoshan, check out the price of high-mountain oolong. I’d generally recommend most people stay away from low-end teas sold by vendors not specialized in Taiwanese tea. Having started my own personal journey into Taiwanese tea on lovely, fragrant, and pricy high-mountain tea my personal bias recommends against buying cheap tea. That being said, there’s no reason to preemptively reach for the top-shelf. There are plenty of perfectly good budget options to begin your journey. Non-high mountain teas like Jin Xuan, Four Seasons, Jade Oolong, and Baozhong can be purchased for inexpensive prices from a number of reputable vendors and can serve as wonderful gateway teas. Most of the recommended vendors in this section are middle-end vendors that sell good bang-for-your-buck tea. A great place for newcomers to Taiwanese Oolongs. Based in Taiwan with ultra-cheap tea, free shipping, great customer service and decent selection, it’s a great place to buy 150 grams of tea to get your feet wet with Taiwanese teas. They also sell teaware including affordable gaiwans and surprisingly decent yixing teapots. The tea is not great, but not bad either. I’d avoid spending ridiculous amounts of money here as there are better, more interesting vendors to explore. If you do decide to make a large order be sure to email zen8tea for a cheaper rate. Summed Up: Excellent selection, free shipping (good for single orders), highly-competitive prices, average reviews. A farm doubling as an ebay vendor. This can help to produce some really great bargains by cutting out the middle-man. This also makes the tea quality vary widely season to season, and is generally less consistent than other vendors. Teahome also has a Taiwanese site with a much larger selection. Summed Up: Good selection, variable but good quality, highly-competitive prices. An ebay store that sells every tea imaginable. When buying higher-end tea it’s usually a good practice to stay away from vendors that generalize their selection too much, but for daily drinkers and newcomers to Taiwanese teas, Dragon Tea House is a perfectly reasonable place to start. They also sell alot of teaware. Stick with the basics (gaiwan, cha hai, etc.) and stay away from their overpriced high-end selection. Summed Up: Excellent selection, free shipping (good for small orders), average prices, average reviews. There are a number of vendors that offer Taiwanese tea but don’t necessarily specialize in it. This list could quickly get out of control but I selected vendors that I feel are the most interesting. A generalist, online vendor and a steepster darling based in China. Their selection of Taiwanese teas is somewhat limited (currently 9 teas) but their prices are good and they offer free shipping for orders over $30. Teavivre mainly sells the popular lower elevation teas (Jin Xuan, Dong Ding, Oriental Beauty) with a more limited high-mountain offering (currently just their Lishan). Teavivre is generally well-reviewed and samples are also available for reasonable prices. Another good place to shop for basic teaware. Summed Up: OK low-altitude selection, limited small high-mountain selection, good prices, low free shipping-cost, samples available, good reviews. Based in San Francisco, Red Blossom’s formosa section features an all-encompassing but generally higher-end selection with unique offerings that cannot be found from your average Taiwanese vendor. Their high-mountain selection is extensive and hits most of the major high-mountain teas (minus Da Yu Ling). Also interesting is their aged tea collection featuring two aged Baozhongs (1973, 1982) and two aged Dong Dings (1970s, 1980). Their Tieguanyin Lishan is also very unique. Summed Up: Small low-altitude selection, good high-mountain selection, good aged tea selection, expensive prices, good reviews. A classic vendor with a very good reputation. Hou de Asian isn’t necessarily a true generalist and specializes in both Pu’erh and Taiwanese Oolongs (two grand genres of tea!). Despite Hou de Asian’s reputation as a high-end vendor, their prices are reasonably priced even when compared with specialists in Taiwanese teas. With a flat shipping rate of $5 from Texas, Hou de Asian is worth checking out. Beware of their teaware.. It’s super gorgeous. And expensive. Summed Up: Good low-altitude and high-mountain selection, average prices, good reviews. The ultimate generalist.With a storefront, strong reputation, book authorship and a truly overwhelming tea selection Tea Trekker should not be overlooked. Prices are competitive but do run a bit high for Taiwanese teas (perhaps a product of such generalization). Summed Up: Good high-mountain selection, smallish low-mountain selection, average prices, decent reviews, 10 g. samples. Some of Red Blossom’s selection. Source: Red Blossom Tea. Most people interested in Gaoshan Oolong will inevitably move onto a more specialized vendor. Here’s a list of many of the available options! Based in Taiwan, Taiwan Tea Crafts are a new vendor specialized in Taiwanese oolongs. Their selection is enormous and features conveniently sized 25g samples. Taiwan Tea Crafts also offers free shipping on orders over $25. Prices vary dramatically depending on the tea itself but are generally pretty competitive. While early reviews are positive, there is not a ton of press on this very new tea company yet. Tthe raw amount of selection is impressive. Stay tuned. Summed Up: Excellent selection (both low/high-altitude), sells small samples, low free shipping-cost, competitive pricing, too new for reviews. Also based in Taiwan, Tea from Taiwan is a longtime vendor of Taiwanese teas. The selection is extensive and quality can vary, but is generally very good. Worth nothing are their three different, all inexpensive, Jin Xuans. While their smallest quantity is 75 grams, they offer a number of sample packs with free shipping, a great place to start for Taiwanese tea newcomers. As a longtime vendor, there are a number of reviews for Tea From Taiwan on TeaChat, Steepster, and on their own site. Summed Up: Good selection (both low/high-altitude), free-shipping on sample packs, good reviews. 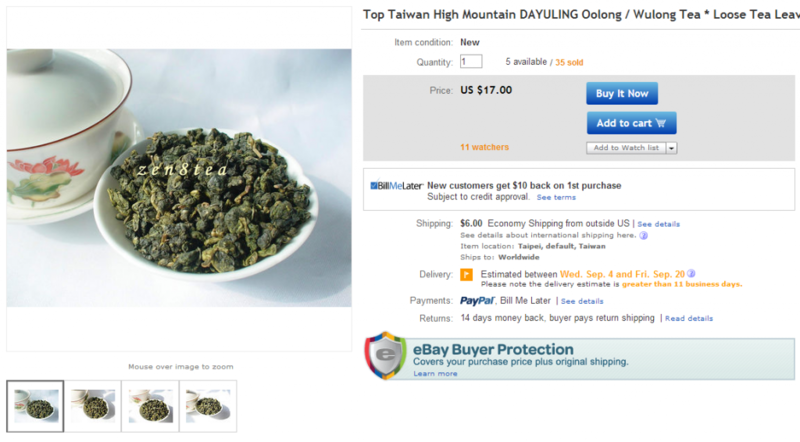 Mountain Tea is one of the most unique vendors listed here. Originally a tea vendor in Taiwan they actually created their own tea garden in the late 80s eventually expanding to three tea gardens (source). While it’s impossible to know the exact margins that vendors take, being closer to the source should allow Mountain Tea to sell at lower prices. Their Lishan in particular is ridiculously cheap. All of the usual low-elevation suspects are also inexpensive. One minor red flag: they don’t share harvest information for all of their teas. 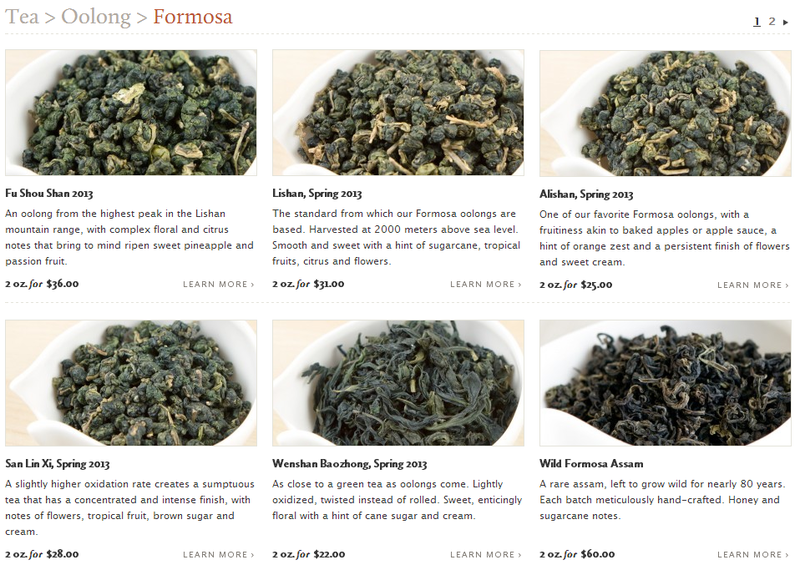 That being said, there are a number of positive reviews (and awards) of the quality of Mountain Tea’s Formosa Oolong. Summed Up: Good low-altitude selection, limited high-mountain selection, excellent prices, good reviews. An excellent vendor based in Seattle. A well-balanced mix of high-mountain and low-elevation and several different cultivars. Shiuwen Tai, the owner, is especially known for her stellar selection of Baozhong tea and regularly offers three different Baozhongs every season. One other interesting tea offered here is the Taiwan Wuyi, a Taiwanese farmers take on the popular mainland Chinese oolong. Floating Leaves also consistently rotates their teas allowing for fairly dramatic changes season to season. Summed Up: Unique low-altitude selection (notably Baozhong), good high-altitude selection, sample packs available, OK prices, excellent reviews. Popular blog ran by Stephane, a French expatriate based in Taiwan. 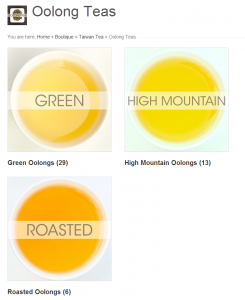 Teamasters is one of the most consistently updated and informative websites specifically dedicated to Taiwanese tea. Stephane also sells extremely highly regarded tea/teaware. One of Stephane’s sources of knowledge is Teaparker, an esteemed Taiwanese Tea Master. To order from Tea Masters, you have to email Stephane asking for a price list and then pay via paypal. Summed Up: Well-curated high-mountain selection, large low-altitude selection, clunky buying experience, excellent reviews, expensive prices, high shipping costs, ships from Taiwan. A new vendor to Taiwanese oolong that is already making significant waves throughout the tea community. Based in Taiwan, with an extensive lineup of high-mountain teas (multiple Lishans, multiple Da Yu Lings) and the usual lower-elevation suspects and small sample sizes Origin Tea is a great place to find top-end tea. How good is the tea? The early reviews have been promisingly and overwhelmingly positive. Tony from Origin has also been known to do special tastings. Summed Up: Excellent high-mountain selection, good low-altitude selection, reasonable prices, excellent tea, ships from Taiwan. Another vendor specializing in Taiwan. Naive Tea offers a balanced selection of high-mountain tea, lower-elevation tea, and flavored tea (this can be a red flag). They also offer their tea in three different sample packs. Summed Up: Good high-mountain selection (reasonably priced), limited low-altitude selection (curiously high priced), good reviews. 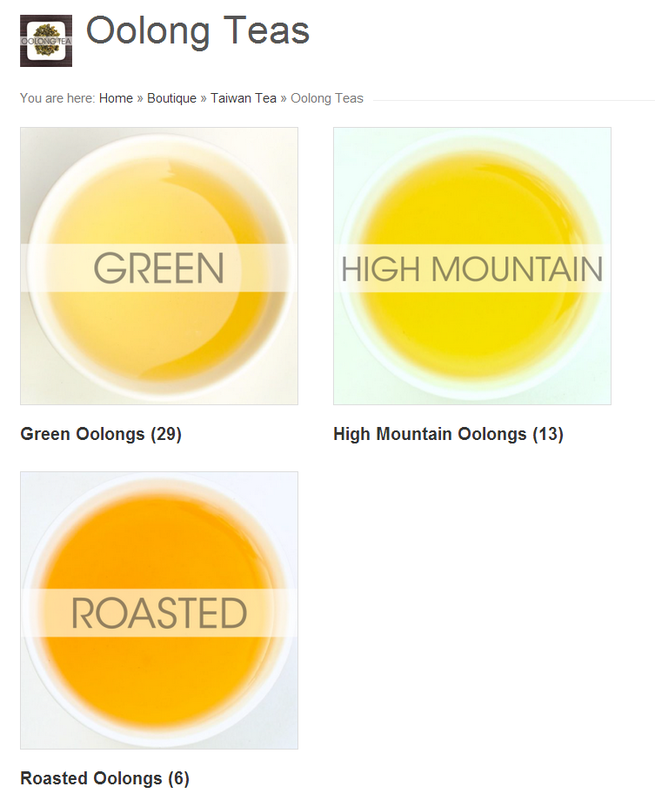 Formerly known as ishop, T-Oolong specializes in Taiwanese Oolong teas. Similar to Tea from Taiwan, the smallest sample size is quite large (75 grams). Based in Taiwan, T-Oolong has an excellent selection and competitive prices. Summed Up: Good prices, good selection, good reviews. Eco-Cha is another newcomer to the western-facing tea world. Formed by western expatriates and Taiwanese natives, Eco-Cha takes an environmentally conscious approach to tea with their primary focus is on artisan tea producers in central Taiwan. Despite a small selection Eco-Cha’s selection is mixed with a diverse amount of teas including budget conscious teas, a few high-mountain oolongs and a few black teas. Their small order size is about 75 grams, bigger than most. Summed Up: Focused on central Taiwan, eco-conscious, good reviews, small selection, gorgeous website, larger minimum size. Beautiful Taiwan Tea is a US-based internet vendor that sources their tea directly from Taiwan. Their selection is varied with some darker teas (Oriental Beauty, Ruby #18) as well as greener oolongs. The green oolongs are made up of some Chin-hsin, as well as more growth-oriented cultivars like Jin Xuan or Si-Ji. Shipping is free at $15, making them very friendly to the Taiwanese oolong uninitiated. Beautiful Taiwan Tea has also done some well-reviewed tastings (1,2,3) on reddit. Summed Up: Good entry-point, US domestic shipping, small but diverse selection, reasonable prices. Everlasting Teas is a New York-based vendor and a relative newcomer to the Taiwanese tea scene. They have a relatively small, but well-curated and diverse selection of teas sourced from Taiwan. Teas include high-mountain oolongs, darker oolongs/blacks, green teas, and even a few aged oolong options. They have been positively reviewed by a couple NY-based sources including the prolific Tea For Me Please. Summed Up: Reasonable prices, US domestic shipping, small but diverse selection. A new specialized vendor with a small, curated selection of Taiwanese teas. Ranging from greens, to high-mountain, to oxidized black teas. A new vendor established in 2017. Leafy Green works directly with Chen Hauying (a Taiwanese based tea producer) and other tea producers (not all based in Taiwan). Chen specializes in Dongding and other oolong teas. Small, mid price range selection of Taiwanese teas. Ships domestically. Taiwan Tea Crafts categorization. Source: Taiwan Tea Crafts. The landscape of vendors is always changing. The goal is to keep this guide up to date with new vendors and current information. If you are a vendor and think you should be included within this article send us a tweet to @teadb an email at teadborg@gmail.com. This entry was posted in Article, Long-form Article, Oolong, Taiwanese Oolong, Tea Learning and tagged Dragon Tea House, Floating Leaves, Hou de Asian Art, Mountain Tea, Naive Tea, Origin Tea, Red Blossom, T-Oolong, Taiwan Tea Crafts, Tea from Taiwan, Tea Trekker, Teahome, Teamasters, Teavivre, zen8tea. Bookmark the permalink. You may wish to revise the first sentence of your entry for Tea From Taiwan, however. Whoops. Thanks for the correction, I just made the change! Thank you for this comprehensive and well-researched listing. decent coverage but a bit old. Taiwan Tea Crafts is my current favorite source, having tried many on your list. They have excellent teas at very good prices. Thanks for adding us to the list! We’ll be adding more of Chen’s teas soon, as well as increasing our non-Taiwanese teas after our upcoming trip next month. We are all about improving transparency and education in the tea industry. If anybody ever has any questions, feel free to reach out here, on twitter, instagram, on the site, etc. “Teamountains” should be on this list as well. They stock quality Taiwan oolongs. T-Oolong should be removed. They no longer sell online. I am interested of the Taiwan Teas in bulk and intend to visit in May this year. I am buyer and import to Sweden. I need help with Taiwan tea producers.